Annuities have become one of the most popular ways to save for retirement and also one of the most misunderstood, overhyped, and dangerous investment vehicles available today. Some annuities are worth the money... but too many are flawed, overpriced, and packed with hidden fees that make them absolutely horrible investments. In The Truth About Buying Annuities, consumer finance expert Steven Weisman helps you make smart decisions about annuities and avoid the lies, misrepresentations, and ripoffs that await uninformed investors. From start to finish, Weisman delivers quick, bite-size, just-the-facts information and plain-English explanations you can actually use. You'll learn all you need to know about immediate, deferred, and variable annuities; actively-managed vs. indexed annuities; inflation-protected and tax-sheltered annuities; and more. Weisman explains the impact of annuities on taxes, Medicare, Medicaid, long-term care, and your other retirement plans. He presents crucial, hard-to-find information about death benefits, joint and survivor annuities, alternatives to annuities, assessing annuity risk, avoiding scams, and even how to escape from a bad annuity you've already purchased. 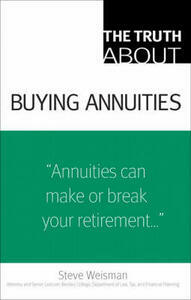 Unlike some books on annuities, this one's simple to read, simple to use, up-to-date, and complete: it's the only annuity guide you need!